Libraries are a convenient location to store blocks that are (or are likely to be) used several times in a model or used in several models. This tutorial discusses the steps involved in creating a library, and some of the features of a library that make it different from a standard model. Adding a Custom Library to the Library Browser. Libraries are created in a very similar way to a standard model. The first step is to use the Library Browser’s File→New→Library pull-down menu to open a new library. (See Figure 1). Figure 1: Creating a New Library. Figure 2: A New Library. Figure 3: Blocks Added to a New Library. A custom library is used in an identical way to using any other library. The library needs to be opened to use it. This is achieved in the same way as for a model -- see Opening a New or Existing Model within the Model Building with Simulink tutorial. Once opened, blocks are dragged from a library and placed into a model in the usual way. The Library Broswer is a convenient tool for grouping all available libraries, hence when a custom library is created the developer will usually want to add it to the Library Browser. Adding a library to the Library Browser is achieved by writing a MATLAB function called slblocks (in a file called slblocks.m). The function slblocks must have a specific format, and slblock.m must be in a directory that is on the MATLAB path. Browser.IsFlat  = 1; % Is this library "flat" (i.e. no subsystems)? % "Blocksets and Toolboxes" view. Figure 4: Example slblocks Function. Once slbocks.m has been written it must be saved, and then the Library Browser must be closed and restarted, for the custom library to be seen in the browser. Figure 5 shows the Library Browser after this has been done, with the custom library being displayed. Figure 5: Custom Library in Library Browser. Figure 6: Opening a Template slblocks Function. Libraries do not get simulated. When used in a model a block taken from a library is linked back to the library. This means that all instances of the block used in all models are guaranteed to have exactly the same implementation. In terms of topology they are in fact exactly the same block. Note that each instance of the block may have different parameters. A significant advantage of being linked is that changes made to the library block will propogate to all instance of the block in all models that use the block. This tutorial has discussed topics related to creating and using custom libraries. 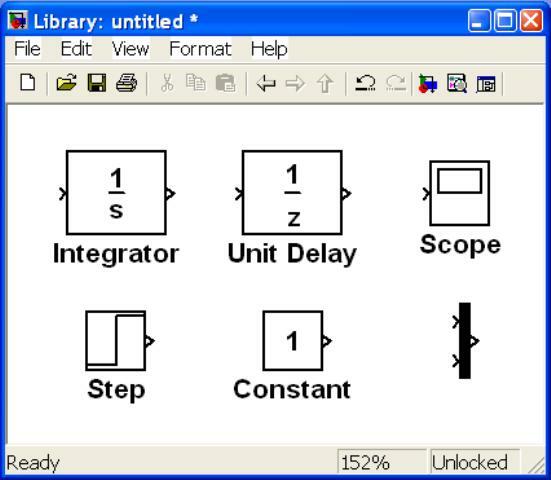 Other Simulink tutorials are available on the Software Tutorials page.